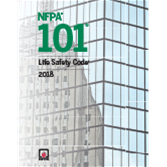 Major changes and an expanded scope make the 2018 edition of NFPA 101®, Life Safety Code® essential in any occupancy -- from assembly to health care, industrial, and residential. As the built environment and risks evolve, so do the challenges to protect people from fire and related hazards. NFPA®'s Life Safety Code is the most widely used source for strategies for occupant safety throughout the life of a building. Vital for architects, engineers, building owners and building managers, hospital administrators, and AHJs, NFPA 101 covers it all: Egress, sprinklers, alarms, emergency lighting, smoke barriers, special hazard protection, and much more. For the 2018 edition, the scope of NFPA 101 is expanded to include hazardous materials emergencies, injuries from falls, and emergency communications. Interested in other editions of NFPA 101? Use the drop down menu above to select the edition year you need. Discover how the 2018 Handbook can help you comply with NFPA 101, Life Safety Code requirements. It includes the full code text along with expert commentary and more than 750 visual references. 4.4 Life Safety Compliance Options. 5.4 Design Specifications and Other Conditions. 5.6 Evaluation of Proposed Designs. 7.2 Means of Egress Components. 7.3 Capacity of Means of Egress. 7.4 Number of Means of Egress. 7.5 Arrangement of Means of Egress. 7.6 Measurement of Travel Distance to Exits. 7.8 Illumination of Means of Egress. 7.10 Marking of Means of Egress. 7.11 Special Provisions for Occupancies with High Hazard Contents. 7.12 Special Provisions for Hazardous Materials. 7.13 Mechanical Equipment Rooms, Boiler Rooms, and Furnace Rooms. 7.14 Normally Unoccupied Building Service Equipment Support Areas. 8.8 Inspection and Testing of Door Assemblies. 9.2 Heating, Ventilating, and Air-Conditioning. 9.4 Elevators, Escalators, and Conveyors. 9.5 Waste Chutes, Incinerators, and Laundry Chutes. 9.6 Fire Detection, Alarm, and Communications Systems. 9.8 Other Automatic Extinguishing Equipment. 9.11 Fire Protection System Operating Features. 9.12 Carbon Monoxide (CO) Detection and Warning Equipment. 9.13 Special Inspections and Tests. 9.14 Risk Analysis for Mass Notification Systems. 11.7 Underground Structures and Limited Access Structures. 12.2 Means of Egress Requirements. 13.2 Means of Egress Requirements. 14.2 Means of Egress Requirements. 15.2 Means of Egress Requirements. 16.2 Means of Egress Requirements. 17.2 Means of Egress Requirements. 18.2 Means of Egress Requirements. 19.2 Means of Egress Requirements. 20.2 Means of Egress Requirements. 21.2 Means of Egress Requirements. 22.2 Means of Egress Requirements. 23.2 Means of Egress Requirements. 24.2 Means of Escape Requirements. 26.2 Means of Escape Requirements. 28.2 Means of Egress Requirements. 29.2 Means of Egress Requirements. 30.2 Means of Egress Requirements. 31.2 Means of Egress Requirements. 32.4 Suitability of an Apartment Building to House a Board and Care Occupancy. 33.4 Suitability of an Apartment Building to House a Board and Care Occupancy. 36.2 Means of Egress Requirements. 37.2 Means of Egress Requirements. 38.2 Means of Egress Requirements. 39.2 Means of Egress Requirements. 40.2 Means of Egress Requirements. 40.6 Special Provisions for Aircraft Servicing Hangars. 42.2 Means of Egress Requirements. 42.6 Special Provisions for Aircraft Storage Hangars. 42.7 Special Provisions for Grain Handling, Processing, Milling, or Other Bulk Storage Facilities. 42.8 Special Provisions for Parking Structures. 43.7 Change of Use or Occupancy Classification. The updated NFPA 101®: Life Safety Code® raises occupant safety to a new level. Protect people where they live, work, and play with NFPA®'s Life Safety Code -- the most widely used source for strategies for occupant safety throughout the life cycle of a building. As the built environment and risks evolve, so do the challenges to protect people from fire and related hazards. The 2015 Life Safety Code provides a flexible approach that adapts to nontraditional use of buildings; innovative designs; and new technologies, materials, and construction practices. It is the only document that addresses life safety in both new and existing structures. There's no substitute for the latest NFPA 101 in any occupancy -- from assembly to health care, industrial, and residential. Essential for architects, engineers, building owners and building managers, hospital administrators, and AHJs, NFPA 101 covers it all: Egress, sprinklers, alarms, emergency lighting, smoke barriers, and special hazard protection. Atrium walls are now permitted to serve as part of the separation for creating separated occupancies, offering greater flexibility in building design. New requirements enhance public safety, such as calculating occupant load for business uses that better represents how the space is used. Requirements permitting the use of alcohol-based hand-rub (ABHR) dispensers are included in more occupancy chapters, reflecting their widespread use. New mandates for carbon monoxide detection and alarm are included for new educational and new day care facilities for greater safety to life where CO might be generated. Expanded provisions concerning the responsibilities, training, and duties of crowd managers help ensure emergency readiness in places such as sports arenas, nightclubs, and concert halls. Revised rules permit door locking in new and existing residential board and care facilities, based on clinical needs to secure residents for their own safety. Health care occupancy provisions allow nursing home minimum corridor width to be reduced within small smoke compartments. Provisions added to permit doors to be disguised with murals for settings like dementia units. New self-contained ambulatory health care chapters improve code usability with one-stop access. NFPA 101®: Life Safety Code® is the most widely used source for strategies for occupant safety throughout the life cycle of a building. Make decisions that impact lives with strategies for occupant safety in NFPA 101: Life Safety Code. Unique in the field, it is the only Code that covers life safety in both new and existing structures. Requirements address building construction, protection, and occupancy features that minimize the effects of fire and related hazards. Each edition builds on important new information about life safety in the built environment, with consensus-based changes that reflect innovative designs, technologies, materials, and construction practices. When tragedies do occur, investigations invariably reveal serious Life Safety Code violations. The 2012 NFPA 101: Life Safety Code evolves to address new building safety challenges and important lessons learned about occupant safety. For this edition of the Code, all new high-rise buildings must meet the requirements of Chapter 11's high-rise building package. Other major changes involve rules for CO alarms and detection systems in certain residential living units, exit stair enclosure path markings, and egress provisions for safe use of elevators for occupant evacuation. Provisions for health care occupancies include compliance options that give patients and residents a more comfortable, home-like environment. The 2009 NFPA 101: Life Safety Code builds on the groundbreaking sprinkler mandates in the previous edition, with added requirements for automatic sprinklers in all existing high-rise health care occupancies and all new apartment buildings without exception. New evacuation strategies and technologies facilitate faster movement of more people in an emergency, including new egress capacity criteria for stairs that are more than 44 inches in width. The 2009 edition of NFPA 101 enhances safety with health care occupancy door locking for patient protective needs, and 2-way communication systems in areas of refuge -- even where the building is sprinklered -- to let people notify responders of their location. The 2006 NFPA 101: Life Safety Code expands requirements for automatic fire sprinkler protection with added sprinkler mandates for all new one- and two-family dwellings, new and existing nursing homes, existing nightclub assembly occupancies where occupant load exceeds 100 people, and new nightclub assembly occupancies regardless of occupant load. This important Code edition also presents a chapter on existing building rehabilitation that provides greater flexibility to encourage adaptive reuse without sacrificing life safety. Previously, modifications to existing buildings had to comply with provisions for new construction. Now, Chapter 43 introduces specific requirements for repairs, renovations, reconstruction, additions, change of use or occupancy classification, and work on historic buildings. The 2003 NFPA 101: Life Safety Code is a complete safety system that includes rules for the full range of occupancies; egress requirements, stair markings, and emergency lighting; provisions concerning features of fire protection; and a sophisticated performance-based option for code compliance. Code users will find revised illumination levels for new stairs, a section addressing written emergency plans, revised requirements for testing of mattresses and upholstered furniture, and a section with "analytical methods" for determining the fire resistance of building assemblies. Other changes address subdivision of building space in apartment buildings, new hotels, and dormitories; and safe egress requirements in industrial occupancies. The 2000 NFPA 101: Life Safety Code references nearly 50 other important codes and standards -- including the NFPA 70: National Electrical Code (NEC), NFPA 13, and NFPA 72. Only NFPA 101 links all these critical codes and standards together to cover all the bases for life safety in any occupancy. Renumbered chapters facilitate referencing. Expanded definitions and an informative primer for new users help you guide workers and educate clients. This edition introduces first-time Chapter 5: Performance-Based Option, with critical guidance for engineers and AHJs working with performance-based design. Streamline referencing and boost productivity with tabs for your NFPA 101®: Life Safety Code® or LSC Handbook. NFPA® makes it easy to quickly find Life Safety Code information with convenient, self-adhesive tabs. Just affix tabs directly to the pages of your NFPA 101 Code or the full-color LSC Handbook for quick access to the requirements and information you need to ensure safety in new and existing buildings. These tabs can be used with the 2018, 2015, or 2012 editions of the Life Safety Code or NFPA 101 Handbook. Order time-saving tabs now and step up productivity and efficiency every day. (Set of 48) Click to order Life Safety Code Tabs.